When reading scientific articles (and even many of the posts made on Across the Universe; from quarks to quasars), you will see the terms hypothesis, theory, and law used to describe something. In the scientific community these words have very specific definitions. For laypeople, sometimes these definitions get confusing because many time these words are used differently in a colloquial context. 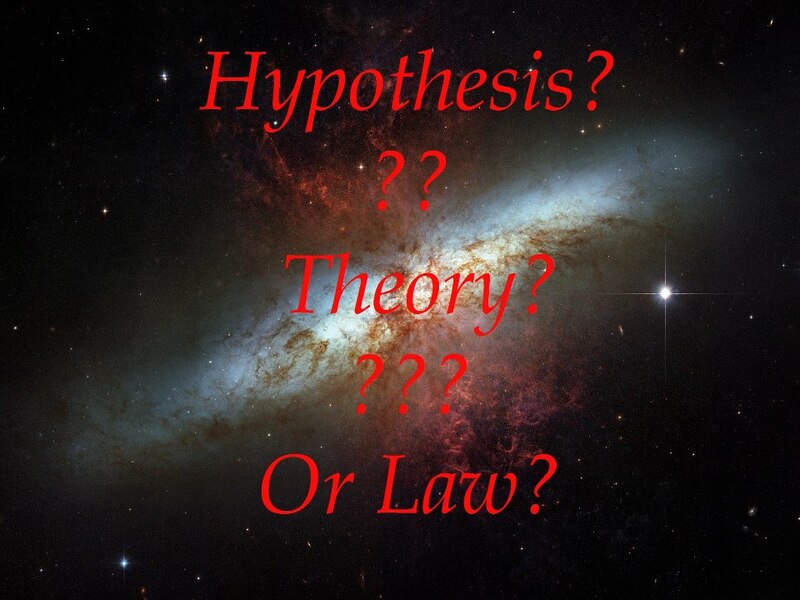 So, what does it mean when you call something a hypothesis, a theory, or a law? Lets discuss them. 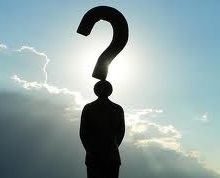 A hypothesis is a reasonable guess based on what you know or observe. Hypotheses (plural of hypothesis) are proven and disproven all of the time. In fact, they play a pivotal role in the scientific method where you formulate a question, create a hypothesis, make a testable prediction, test, and then analyze the data. Even then, a hypothesis needs to be tested and retested many times before it is generally accepted in the scientific community as being true. Example: You observe that, upon waking up each morning, your trashcan is overturned with trash spread around the yard. You form a hypothesis that raccoons are responsible. Through testing, the results will either support or refute your hypothesis. 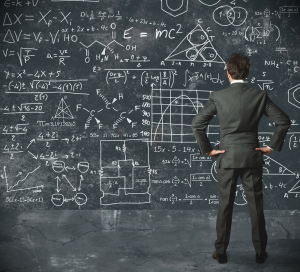 A scientific theory consists of one or more hypotheses that have been supported with repeated testing. Theories are one of the pinnacles of science and are widely accepted in the scientific community as being true. To remain a theory, it must never be shown to be wrong; if it is, the theory is disproven (this also happens). Theories can also evolve. This means the old theory wasn’t wrong, but it wasn’t complete either. When Sir Isaac Newton discovered the theory of gravity and wrote laws that explained the motions of objects, he was not wrong; but he wasn’t fully right either. Einstein later discovered the theories of special and general relativity and this creates a more complete theory of gravity. In fact, when you stay far below the speed of light, many of the equations in general and special relativity give you Newton’s equations. NASA, for the record, uses Newton’s equations when planning missions for their spacecraft. What happens when you have two theories that contradict each other, as is the case with the Static State and Big Bang theories? For a very brief summery on these theories. 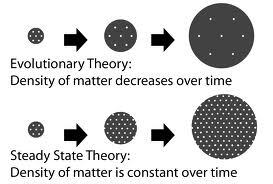 the Static State theory says the universe is static and doesn’t change whereas the Big Bang theory says the universe started at some point in time in a ‘big bang’. In this case, scientists make observations, hypothesis and testable predictions to figure out which one is right (Example: I observe the universe is expanding, I hypothesize there was a beginning, I test by doing the math). Eventually, either one theory is overturned completely (as is the case with Static State vs Big Bang) or the correct aspects of each theory are combined to form a new theory. In either case, the theories then need to withstand the rigors of testing and retesting. After a theory proves itself overtime, it is accepted into the scientific community as being correct. In many cases, these theories are the groundwork on which other theories are built on. An example is general/special relativity, these theories lay the foundation for many, many other theories and equations (such as Hubble’s law and the Schwarzschild radius). If relativity were ever overturned, that would be very bad. Note: In cases like relativity, since the math always works out, the likelihood of that happening is very, very small. Rather, relativity will probably be proven a smaller piece in a lager more complete theory scientists hypothesize about called Grand Unification – but that is a post for another time. Scientific laws are short, sweet, and always true. Many times laws are expressed in a single expression. Laws cannot ever be shown to be wrong (that is why there are many theories and few laws). 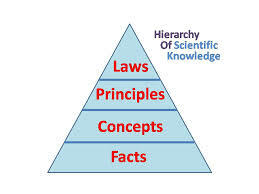 Laws are accepted as being universal and are the cornerstones of science. If a law were ever to be shown false, then any science built on that law would also be wrong; then the domino effect would have a new (and devastating) meaning. Some examples of scientific laws (also called the laws of nature) include the laws of thermodynamics, Boyle’s law of gasses, the laws of gravitation, and a several others. Theory vs Law – which is better? In the end, it is all about using it correctly. A law is used to describe an action under certain circumstances. A theory describes how and why something happens. As an example, in Einstein’s famous equation E=mc^2, this describes the action of energy being converted to mass. The theories of special and general relativity show how and why something with mass is unable to travel at the speed of light. I hope that this will help expand your knowledge on what it means when scientists call something a hypothesis, a theory, or a law. Are there any planets that do not actually orbit but are instead stationery relative to their parent stars? A Rocky Relationship: Is the Moon Leaving the Earth?